In Alaska, environmentalists are currently fighting a proposed coal mine in the watershed of the Chuitna River, 45 miles southwest of Anchorage. This strip mine will not only destroy salmon spawning grounds. It will literally remove 11 miles of the Chuitna’s Middle Creek tributary by mining through and therefore dewatering it. If the project goes ahead, there will be no mystery about why Middle Creek disappeared. In the former lead mining areas of Derbyshire’s Peak District, there’s a disappearing river too. But there’s also a sense of mystery about its strange behaviour. One of the Key Stage 2 activities that the Lathkill Education Service attached to the Lathkill Dale National Nature Reserve runs for local schools is ‘why the river disappears – solve the mystery of the disappearing River Lathkill through this investigation of the geology and wildlife of the area’  (‘kill’, incidentally, means ‘creek’, ‘stream’ or ‘channel’ in old Middle Dutch, and was a name attached in the seventeenth century to creeks and streams across what became the northeastern United States – as in Kill Van Kull, Bronx Kill and Schuylkill River). Natural England, which manages the Lathkill Dale reserve – one of five reserves that make up the Derbyshire Dales National Nature Reserve – also refers to the Lathkill’s ‘vanishing act’. As Natural England proceeds to explain, the upper river’s disappearance is part of the legacy of the two lead mines (established in 1740 and 1797 respectively) that operated in Lathkill Dale until the mid-nineteenth century: ‘the soughs are responsible for causing the river to dry out today’ . ‘Where has the river gone? is also the question posed on the interpretative board that Natural England has erected at the bottom of the ladder that leads to the mine shaft under Bateman’s House (an engine house converted into a dwelling for the mine agent and his family, though empty since the 1840s). 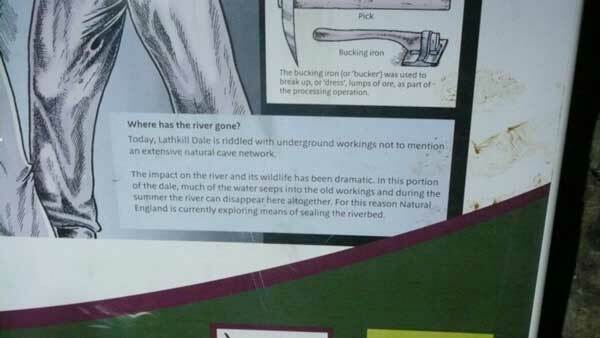 Who (or what) has been messing about with the Lathkill? 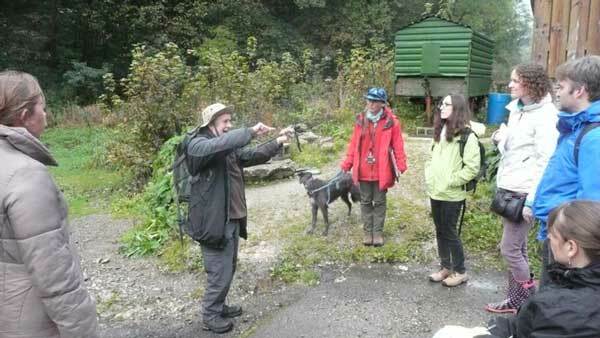 Our project team meeting in Derbyshire in early October provided the opportunity to find out. Our schedule included a field trip to Lathkill Dale, one of the key sites for Carry’s and Georgina’s study of the area’s soughs – underground channels forged to drain water from the area’s lead mines. Our walk began down in the dale at a point where our guide, John Barnatt, an archaeologist with the Peak District National Park Authority, could stand with his back to the (at the time) water-less Lathkill River, whose peculiar annual lifecycle we now began to piece together. The Lathkill River is not exactly unique, though. It’s normal for streams running through limestone strata riddled with a network of natural caves to flow underground in summer or periods of drought when water levels are low. But this seasonal tendency is accentuated by the construction of soughs that lowered the water table and created a network of diversionary channels that can capture river water. For some, the river’s seasonal disappearance is a problem to be resolved. (This interest group includes anglers: the Lathkill brown trout is a renowned quarry that merits inclusion in James Prosek’s definitive compendium, Trout of the World , in which Prosek quotes the comment  of a friend of Izaak Walton, James Cotton, that the Lathkill ‘breeds the reddest and the best Trouts in England’ .) Because of what Natural England refers to on its Bateman’s House signage as the ‘dramatic’ impact on the river and its wildlife, the managing agency is ‘currently exploring means of sealing the riverbed’ so that the water does not drain off into Magpie Sough. Whether this waterproofing remedy will be sufficient in itself to restore a perennial flow to the Lathkill is now increasingly debated, however. Since some of the river’s water travels through Magpie Sough, plans now focus on the establishment of some sort of blockage in the sough in addition to sealing the riverbed – and this blocking proposal is a major source of controversy (many thanks, Carry, for bringing this latest development to my attention). A (fluvio-centric) view from under the bridge across to Bateman’s House (Photo: Peter Coates). But has the river really disappeared? And what do those who want to ‘improve’ the sometimes dry river want to restore? A living river? An attractive recreational resource for anglers? Rather than dwell on the seasonal absence of water or the fortunes of fish (during dry spells, trout can be trapped by receding water levels and this entails relocation), we might want to think about attaching a new story to the Lathkill, a story that diverts attention to the seasonal presence of a riverbed carpeted lush vegetation, for example. For me – as an outsider visiting for the first time and someone who has no stake in the debate – the problem is not so much the seasonal disappearance of the river’s water, but our generic expectations of what a river should be. After all, though the Lathkill’s liquid content may vanish on a regular basis, its form and overall function remain the same. This replacement narrative tailored to this particular body of water might begin by reclassifying the Lathkill as an intermittent stream. This would elevate it to the respectable international company of a distinctive type of watercourse that includes the arroyo seco ([seasonally] dry stream) of southwestern North America. This would also underscore its status as a different river rather than a lesser one (compared, that is, to a ‘proper’ river). 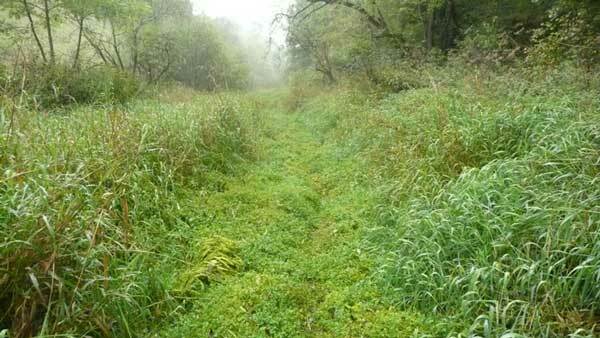 And if the privilege of re-naming the intermittent stream that flows through Lathkill Dale were mine, I would not hesitate to call it the Mossy Cobbled Bottom Kill. It is a shame that the cause of preservation is often reduced to a clash between the attributes of cultural heritage and those of natural heritage, with the respective interests of History and Nature being advanced by ‘the archaeologists’ and ‘the historians’ and the one hand and ‘the ecologists’ on the other. Environmental historians, it seems to me, are well positioned to reconcile these two often warring positions. 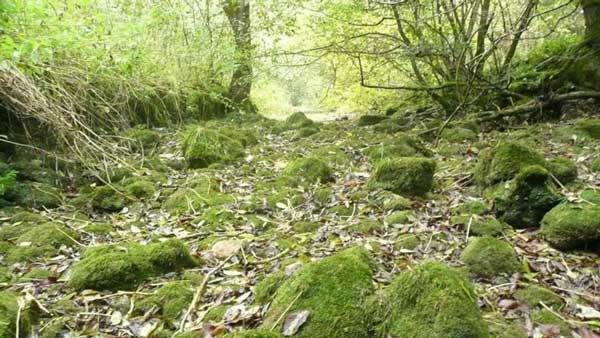 The Mossy Cobbled Bottom Kill, aka Lathkill River (Photo: Peter Coagtes). Natural England, Derbyshire Dales National Nature Reserve (2010), p. 3. James Prosek, ‘Trout of the World’, Field and Stream, October 2003, p. 77. Such useful questions raised here, Peter. When is a river no longer a river? This really resonates with The Power and the Water Project as a whole, doesn’t it? 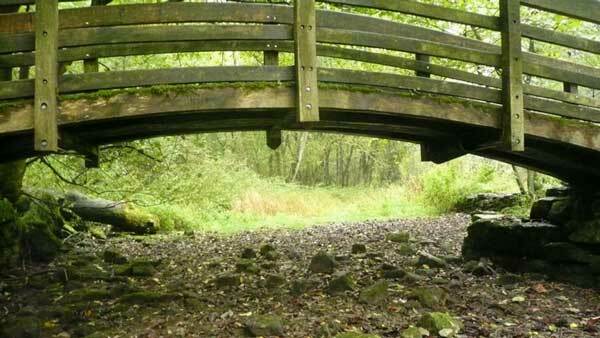 I like the serendipity of the link with Leona’s recent piece on Kielder Water and Forest. After all, there is so much in a name. Publicising what is essentially Kielder Reservoir as a ‘Water’ is a useful way of moving perceptions of the Kielder landscape closer to those relating to a ‘natural’ lake. As you say, publicising the Lathkill as an ‘intermittent stream’ rather than as a regularly dried-up river may help people to embrace it for what it has become, rather than what it is no longer. Can we extend this approach? Historical sources leave us in no doubt that the Somerset Levels was from time immemorial understood to be a place of summer grazing, rather than one of year-round arable farming. Re-engaging with the idea of the wider area as the Somerset Wetlands or Marshes, rather than as the Levels, could perhaps be the start of a pragmatic reorientation. Which leads on to the question of which individuals and/or groups are, or have been, concerned with directing change. Perhaps, as you suggest, environmental historians are both usefully-positioned and equipped to mediate between stakeholders.